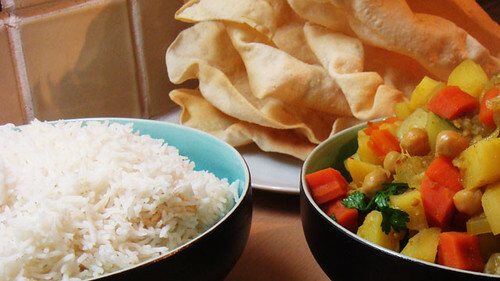 No-place does vegetarian food like the South Asian subcontinent. I’ve had very good vegetarian Italian, Japanese, Thai and for want of a better name, fusion food. But nowhere, and I mean no-where, that I’ve come across takes vegetarian based cooking so seriously and has such a breadth of veggie food. It’s my go-to cuisine when i’m in need of a serious green (or orange, yellow, red etc) flesh-free hit. And it tastes so good. There’s nothing better for a winter’s day (particularly if you don’t feel like a weighty stew) than tucking into a large bowl of dhal – urad, masoor or moong – light, simple and warming. Or maybe a spicy potato, pea and tomato curry underpinned with asfoedita, cumin and chilli mmmm-mmm. There’s a dish for every mood – which is just as well as I had a whole bunch of slightly tired looking veg to use up. In our veggie box were a small, reproachful bag of new potatoes and dirt encrusted carrots. Lurking in the fridge a bendy stalk of celery, a cucumber and a single tomato. A recipe from Hugh F-W on the Gruniad’s food site gave me the basis for something built round chickpeas and potatoes. So all was set for an simple feast, which is the best kind of feast – particularly if it’s 7:30pm and you’re making it yourself. One of the beauties of Indian (like any great cuisine) is its adaptability. Potatoes, chillies, celery and lemons weren’t originally part of Indian cooking, but all were quickly adopted after being introduced by European, Arabic and Central Asian traders. It’s the same throughout the subcontinent. Vindaloo, for example, comes from the marriage of Indian spices, wine vinegar, potatoes and chillies introduced by the Portugese in Goa. The great thing is that all the different regional cuisines of the subcontinent (the plural is deliberate, talking about South Asian cooking is roughly equivalent to talking about Mediterranean or European cooking, and all the diversity that implies) absorbed, adapted and changed while keeping their essential character of balanced spiciness derived from Ayurvedic principles. Food from this part of the world is a constant delight as I discover new dishes, from the coconut curries and dhosa’s of the south to the Royal Mughal cuisine of the north. From Bengali fish to Gujarati mangos, Jain vegetarianism to Muslim meat from Hyderabad. I didn’t weigh my ingredients so will do my best to convey what quantities you need. Actually, you know what? You don’t need exact ingredients anyways – I reckon it’s more fun to cook as much by feel and proportion as you can. The smooth potatoes, sweet carrots and earthy chickpea all lend this slightly different textures and tastes, underpinned by warm spices and some decently hot chilli flakes. The Turmeric, as well as lending the curry a glorious yellow shade, adds astringency, is good for your digestion and leaves bright yellow indelible stains on whatever it touches. So be careful. Especially if you take this for a packed lunch with a white shirt. Thus spake the voice of bitter experience. Peel and slice the potatoes and carrots into small child-bite sized pieces. Finely slice the onion and celery and fry over a low heat in a tblsp of oil (olive or ground nut). Peel and grate the ginger and crush the garlic. When the onion has softened and coloured slightly, add the cumin, coriander, turmeric, chilli, mustard seeds, garlic and ginger and stir it around until you can smell the garlic aroma rising from the pan, about a minute. Then pour in the stock, stir and bring to the boil, turn down to a simmer and let it bubble gently away for about five minutes. Add the diced carrot, potato and chickpeas, turn the heat right down, cover and let it bubble away until the potato is cooked, about 12-15 minutes. Stir in the coriander leaves, taste and season as required. Serve with some plain white rice and a dollop of thick Greek yoghurt on top. Cachumbers serve a similar purpose in South Asian cuisines (particularly that of Maharashtra) as salsas do in Mexican food. And they’re very similar with fresh onion, coriander, tomato all soured and spritzed with lime (or in my case lemon). They’re a great accompaniment to the meal and really cleanse and refresh the palate if you have a lot of strong flavours. I read about them in the wonderful 50 Great Curries of India by Camellia Panjabi. I’d recommend this for anyone who wants some simple and interesting recipes from all over the sub-continent. Finely chop the onion or tomato as small as you can. Chop the coriander and mix all three ingredients together thoroughly. Squeeze in the lemon juice, add the salt (and a little black pepper if you like) and stir in. Serve as a side. This is a basic yoghurt based sauce – I use 10% fat Greek or Turkish yoghurt where possible becasue it lends it a really rich and creamy taste and luxurious texture. To be honest, I love strained yoghurt and would happily sit down and eat this with a spoon like a stub of Roskilly’s best vanilla ice cream. It’s also supremely adaptable and fresh mint and parsley, finely chopped and deseeded tomato and ground cumin all make good additions. Peel and grate the cucumber, and squeeze out as much water as you can. I just grab handfuls of the stuff and squeeze as tightly as I can over the sink. Whip the yoghurt with a fork until it is super-smooth and mix in the cucumber. Finely chop the coriander and mix it in. Grind in the pepper and add the salt/lemon juice (I prefer the latter, although it’s not strictly south Asian). 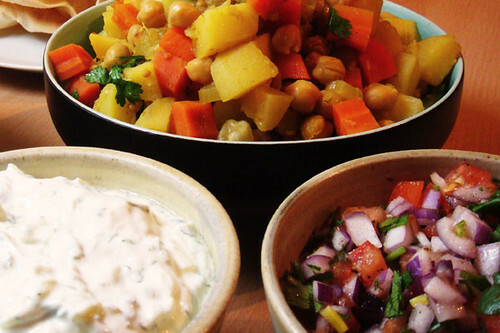 Mix thoroughly and serve with any spicy dish or bread, poppadoms, nachos – whatever really. This is perfect-sounding food to me. Thanks Thursday – it is tasty and quickish to prepare too – good weekday food.